The Alley has experienced weather that many expect in July than early April. That's the perfect time for swinging. 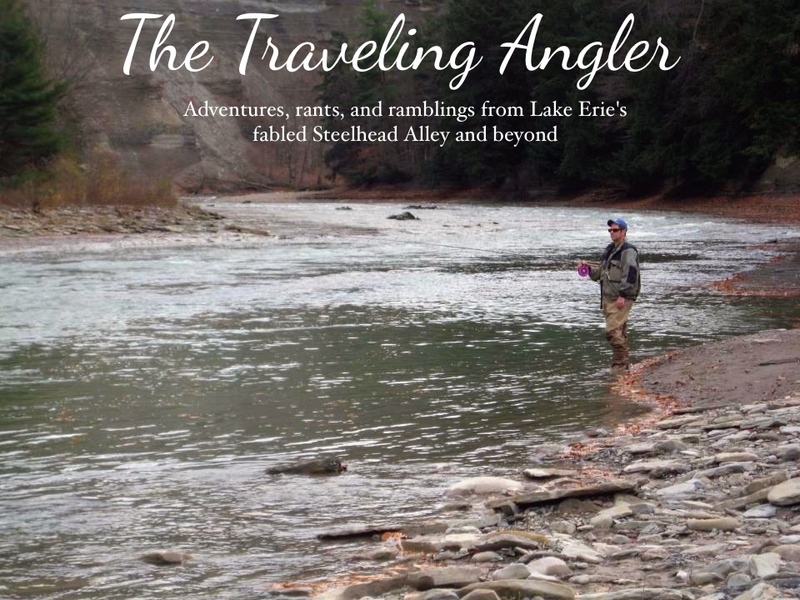 Once upon a time, I fly fished for steelhead when I lived in Canada. Pinning at the time was a craft done by a handful of people. The rivers and streams of Northern Ontario were deep and swift. They were tailored made for sink tips and swinging. But I found the Alley's slower moving streams better suited to float fishing. But I still love to pull out the fly rod for time to time. This past season we've seen lower than usual numbers of fish and I was curious to see how of them had spawned prior. I knew where all of the prime spawning areas were and how many fish would be dropping back? Who knows. 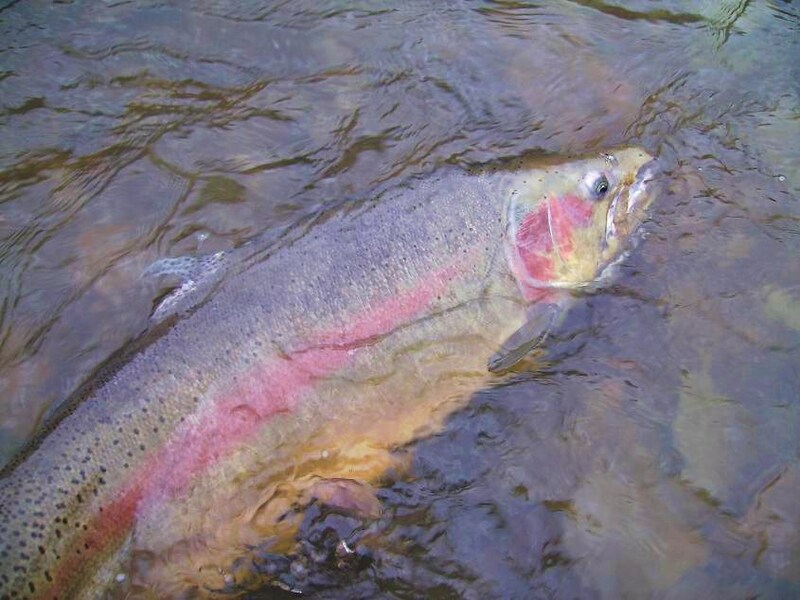 The water temperature was probably in the low 60s and that's pushing into the upper limits for steelhead. Every year, I see the bottom of streams littered with fish that died because some angler decided to hot dog or failed to properly revive the fish. When these fish are on gravel they're vulnerable because of being caught over and over. Spawning itself is a stressful event and I can't imagine being flossed or snagged over and over. The fish that make it unmolested seek the deeper holes and pool to rest and prepare for the trip back to Lake Erie. Dropbacks are often aggressive and swinging large streamers often entice this fish to hit with a vengeance. It was still dark when I arrived at the upper section of the river. The surrounding woods were full of bird songs. I could make out the familiar songs of robins, sparrows, cardinals, wrens and the gobbling of turkeys. It was a easy walk along the trail and after 30 minutes I arrived at my destination. There was enough light when I arrived so I walked up to the riffle to see if any fish were on gravel. I really didn't see anything moving. But this spot is very popular with guides. Guiding on the Alley is a chess game especially in the spring. Many of them look for the best gravel beds to put clients on easy fish. This spot is very popular but there are better spots farther up. I knew I would have this spot for a while. Last season, me and a friend drifted the upper section and there was a lot of boat traffic. Luckily we were fishing for droppies so we didn't have to compete for space. At this spot, we ended up catching over 20 fish - all spawned out hens. The gravel upstream resembled a mine field. This morning I only seen a couple dug out beds. The Alley can be bust or boom depending what river your on. One year the riffles are choked with fish and others your lucky to see a handful of them. The rivers are always changing so constant scouting is a must. I tied on a large white zonker onto a 10 pound tippet. With water this warmer, I wanted a furious but brief battle. I position myself at the head of the run. The river splits around a small island and most of the fish dropback into there. I did a roll cast and let the sink tip drop. I could feel it bounce along the bottom and then I felt several taps then a take. I set the hook and felt a surge. The fish erupted from the water and danced about. It was an intense battle but with a heavy tippet I ended the fight quickly. It was a spawned out hen as her body had several wounds on her tail, probably from digging out beds. I quickly released her and she bolted for the hole. I moved back to the top of the run and started swing further out. The tip settled and rolled along the bottom. This time the take was more violent. The rod slammed and the fished bolted downstream. My trusty Teton reel screamed as I loosen the drag. I steered the fish into the slack water. It was a large male, probably over 10 pounds. He was a beautiful specimen - rosy red cheeks, heavily kyped and of course sporting several flies stuck on his back, tail and belly. I pulled a total of 6 flies from him. It was early morning when I decided to see if fish were on gravel. The water was still slightly off color and all I seen were suckers - a lot of them. I strained to see the large hulking shadows of the males or a plume of mud done be a hen digging out gravel. I only seen two males jockeying for position. That meant most of the fish here were done spawning. I resumed to swinging the entire pool and I only managed three more fish. The sun starting creeping higher and then I could see a drift boat in the distance. It was only 10:30 in the morning. Either the fishing higher up was terrible or the spot was packed. I was leaning more to the latter. I could see the guide's expression and it was of worry because he figured I must of worked the fish over. He never got a chance to ask me because I was already hitting the trail for other water downstream. It turned out to an exercise of futility as I never got so much as a bump all the way back the bridge. By then I was burnt and parched from the heat. I was drained of what little energy I had left. With it being this late in the year, I'm usually burned out from the fishing and it doesn't take much for me to walk away from the river. That's what I did as I rolled into the gas station and bought the biggest bottle of water. It was enough to last the hour ride back home. The morning was fun even though it was brief.